The idea behind the Dog Brick is for your dog to dislodge the removable bones and push the sliding covers to reveal hidden treats. And for even more of a challenge, there are easy to open/close flip compartments to also hide treats in. The Dog Brick encourages mental and physical stimulation and helps to prevent boredom. You may choose to put treats in one, several or all of the compartments, depending upon the dog’s experience and enthusiasm for the game. 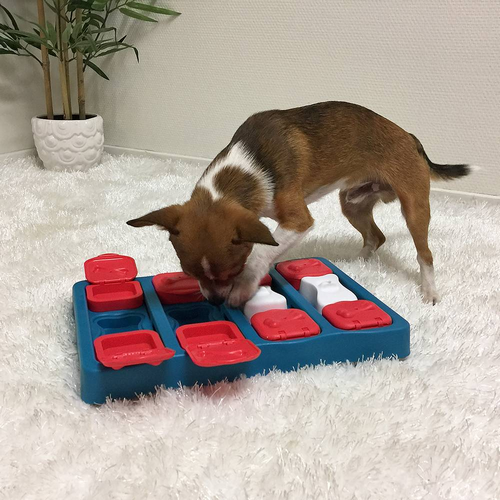 The Dog Brick has many variables to increase the level of difficulty as your dog’s skills improve. The bones have a small hole to allow the scent of the treat to pass through and encourage him to use his extraordinary sense of smell. With a little practice, they will soon learn to dislodge the bones and slide the covers to reap the hidden rewards. 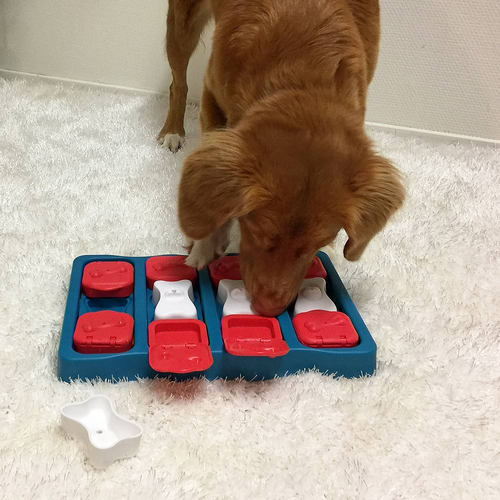 The Dog Brick has been designed by Nina Ottosson as an interactive game for you and your dog to play together. 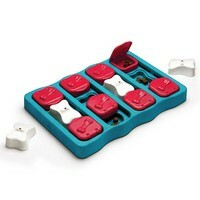 To ensure safety, the durable plastic has no sharp edges and is non-toxic. Full instructions on how to use the Dog Brick are included. Tough and hard wearing plastic with no sharp edges to ensure safety. Water and slobber proof, no matter how excited your dog is trying to solve the challenge of the Dog Brick. Anti-slip feet to prevent the Dog Brick moving during play time. Encourages your dog to think and helps to prevent boredom. Level 2 dog games like the Dog Brick offer increased stimulation and learning options. Your dog will benefit from the mental challenges and grow through interaction and fun with you! Size: 31.5 x 21 x 4 cms.